Saturday I got a big box in the mail. To my suprise it was 100 home-made cookies from my friends and coworkers, Bryan and Leslie. The PowerSchool division of Apple is a great place to work. They have been very supportive of me deploying to Iraq. I really look forward to getting back to California and working with such great people again. 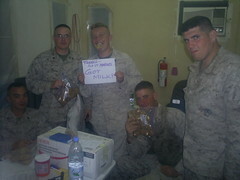 The Marines of S-4, CLR-25 say thanks for your support.